The easyHotel London Heathrow Airport brings all the advantages of the easy brand to hotel bookings at Heathrow. The facilities may be limited but if you are only there for a short nights sleep you don’t need much. 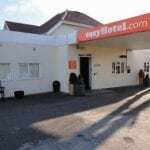 Located on the A4 Bath Road, with on-site car parking and serviced by the Hoppa Busses the easyHotel is a fantastic and fantastically cheap option. The rooms have a double bed and en-suite shower. A plasma TV and Wi-Fi access is included in the rom but an additional charge is made for usage. The hotel does not offer cots. There are no dinning or bar facilities at the hotel but vending machines provide drinks and snacks, with take away breakfast and dinners available on request from reception.